Home » The 1st LGBTQ History Stakeholder Forum! California made a historic move by being the first state to require LGBT representation in history and social science in K-12 textbooks. The Fair Education Act is a California law passed in 2012 requiring schools to provide accurate, fair, and respectful information about the contributions of lesbian, gay, bisexual and transgender people throughout history. Along with educators, historians and community members committed to the implementation of the FAIR Act—I am participating in helping co-create a high-quality LGBTQ-inclusive professional learning program for teachers and administrators. The first LGBTQ History Stakeholder Forum was hosted by Our Families Coalition (OFC) and was held at the Google Community Space in San Francisco on October 12. OFC works to ensure that all students feel safe and validated at school, including those who are a part of LGBTQ families or who identify as LGBTQ themselves. They are committed to making sure California students can grow and learn in an environment free from harassment, bullying, and prejudice. The Stakeholder Forum was a blue-sky brainstorming session meant to help narrow our focus and create a plan of action moving forward. It was exciting to be a part of this planning process, and as the day progressed, I began realize how much time it will take to get this program implemented. Building a solid curriculum and effectively training educators and administrators will require a lot of sweat equity.OFC will be hosting another Stakeholder Forum at the LA LGBT Center in Los Angeles, CA on February 1st, 2019. Register here. The intention of these forums is to bring all our collective insight to bear on the content and structure of the inaugural LGBTQ history professional learning program (to be hosted in Spring 2019). The California State Board of Education approved 10 LGBT-inclusive history textbooks for elementary school students in grades K-8 last November. Two textbooks were rejected on the grounds that they did not include LGBT history. This exclusion violates The FAIR Education Act. OFC houses The FAIR Act website and played a big role in demanding that the textbooks omitting LGBT history be rejected. Creating a professional learning program and making sure LGBT history is included in our schools’ textbooks is paramount, but we will also need to develop more resources, lesson plans and information for educators. I learned at the Forum that one way for educators to implement the FAIR Act is to use intersectionality by presenting a lesson about state-mandated historical events using a lens that is LGBT inclusive. 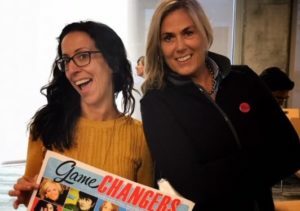 In the meantime, I’m raising funds to get my book, Game Changers, Lesbians You Should Know About reprinted and into the remaining 267 public high schools in the San Francisco Bay Area, serving 206,500 students. My original goal was met earlier this year when I gave books to 48 public high schools in Marin, Berkeley, Oakland and San Francisco, serving nearly 50,000 students. If you participated in that crowdfunding push— thank you! This time around I’m not using online crowdfunding. I am applying for grants and asking for tax-deductible donations from corporations and individuals. Donations of $100 or more entitle you to a signed copy of the book and an opportunity to choose to have your name printed in the next edition as a sponsor! Game Changers just won an INDIE award for best LGBTQ2(Spirit) book and a lesson plan and eBooks are in the works. 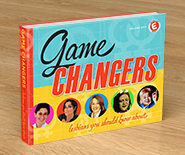 Find out more and how to donate at Lesbian Game Changers.com.